Keith and Lynn Morrison founded Morrison Aluminum Construction in 1985. Keith was licensed in all facets of aluminum and concrete construction. Together they built a solid business with a reputation of quality work and affordable prices. Both Keith and Lynn are graduate’s of Cape Coral High school and Keith gained his construction knowledge on the job working his way through high school and the years following on many large projects being built in the area, including Burnt Store Marina. Keith attained his State Construction License and is qualified to work on all facets of single-family home construction and remodeling. Incorporated in 1997 as Morison Aluminum Construction, Inc. Pool division and DBA as MAC Custom Pools – Aluminum, we were founded by a partnership between Keith and Lynn Morrison and Roland J. North (R.J.) as the license holder. Mr North was an integral part of our pool construction business. He had offered his training and expertise through his many years in the pool industry. R.J. Passed away in 2008 from a long battle with cancer. Kevin Morrison became a partner in 2005 and brought his nearly 20 years of construction knowledge through the insurance industry while working for a major insurance carrier in Florida as well as having his own appraisal and claims business which he sold in 2008. Kevin attended Cape Coral high school and went on to receive his AA degree at Edison Community College and followed up with his BA degree from Nova University in Ft Lauderdale. Kevin studied for and attained his residential pool license in 2007. Since then, this dynamic team has built a reputation of trust, integrity, experience and un-compromised quality! 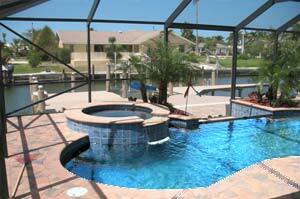 MAC Custom Pools’ showroom/office/shop is located in Cape Coral where we have been from our inception. This central location allows us to provide quality service from Sarasota to Marco Island, Florida.